When I was a working stiff I use to hand out business cards when meeting people and would get them in return. Had a nice little roledex where I kept them. 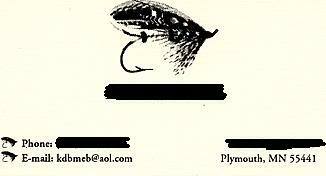 In retirement does anyone still use a business card with the usual and customary information. I have boxes of old unused cards that I should probably throw away as the mega corp I worked for changed names about very five years or so. But seriously, I was thinking about getting some type of card printed up nonetheless. What do ya'll think and what would you put on yours if had some printed up. I've run across a few people that have cards for retirement contact info. It's a quick way to give your phone/email to people you want to stay in contact with. I don't have a "personal" card yet but I'll give my business card to people with my cell phone written on it. They're cheap and can be a convenience if you meet people you might want to see again. I will probably have one. It would be convenient. When we retired, we moved. I printed up cards and they come in handy. We also put a couple of them in the change of address notice we sent out to friends. Somewhere around 1991, when cavemen engraved brass plates with the text, I got a "really good deal" on 1000 official U.S. Navy calling cards. Heck, I probably paid $30-$40, but we hadn't yet started using Quicken yet so I don't have the records handy. We just finished using them up last year as scrap paper. Haven't felt the need to carry any since I retired. I was working on one about 3 weeks ago, and got side-tracked by nice weather! If we ever get a rainy day around here, I'll dig out my package of blank business card stock and print some up. They do come in handy....address and phone number....so folks can find me (now that I'm no longer imprisoned employed). It's a lot handier than having to write it down for people! We have cards that we print on demand that contain Address, Phone#s and website URL. We use them sparingly mostly when we meet new people socially. We are going to add other websites on the back like this one, webshots, epinions, and a space to add their own comments like where they met us and why they might be interested in keeping the card (we do that to not forget the context). My dad retired from the Foreign Service and go his PI license. I think that he had new business cards with that printed on it. I have seen retirees using personal cards with contact information on it. You can get them printed fairly cheaply. Let's face it.... you are likely to not need near as many as when working. That said. Consider going to staples or office depot and getting some good 11x8 card stock (thick paper) and print a page of cards using an inkjet printer. Then cut them up to the appropriate size using a paper cutter. I travel a lot and meet a lot of people who I want to keep in touch with. Sometimes I find myself talking with someone on a guided tour of a museum or hike or . . . and we find a common interest and want to stay in touch. They might have traveled somewhere I want to go or vice versa and we agree to exchange information that isn't readily available where we are currently meeting. I also do a lot of volunteer projects and meet people with similar interests. A personal card makes it quick and easy to exchange contact information. Otherwise you find yourself looking and fumbling for a pen and paper as you say your goodbyes. DW finds sales on card stock and we print up our own personal cards as we need them. Of course you have to remember to carry them with you or they aren't much good. I am still working, so I always carry business cards with me. That practice is as much a part of my job as showing up at 6 AM sharp every weekday morning. Ugh. My business cards are for introducing myself and/or providing contact information in a business setting such as meetings. I can only think of a couple of social contacts to whom I have ever given a business card, though. Why would I? We have no business interactions. They can look up my home phone number in the phone book. It is easy to make cards for yourself these days, using business card stock from an office supply store and MS Word. If I was retired, and felt a burning need for cards, I would not mention my prior employer on the card, nor would I include their insignia or that sort of thing. That's silly. I might just put "Retired, and loving it!" with a drawing of a bird in flight or some such thing, and then my phone, snail mail, and e-mail addresses. But really, I probably wouldn't waste the money. I use business cards that are provided by a non-profit organization that I am associated with. It contains all of my home info as well as my email address. I give them out regularly even when it is not related to the organization's activities. some people call them networking cards. very useful for single people still on the hunt. a lady who i used to be in contact with when i was caregiver for mom carried with her cards regarding the condition of her husband which she handed out on the sly so people around her (hotel clerks, waiters, etc.) would understand her husband's condition and respond accordingly. i thought that was a great idea because i always used to have to find a way to inform people around me without mom getting paranoid, like at the pool to make sure the lifeguards kept an extra eye on her. I had these made up about 10 years before I left the workplace, because I knew I was headed for FIRE. I have had cards for my hobby for a long time (way before retirement). I don't use a lot of them and print up 50 or so every fews years or when I want to change the design or info. Handy for exchanging info with people in the same hobby. I just print them on light gray card stock and cut them out. If we need cards, then we need titles, right?